The trappings of the theater are naturally temporary: lines are forgotten, props are tossed in the garbage, and actors are also tossed in the garbage except for stage great...umm.... For a craftsmen fed up with his set-pieces being scrapped, check out A. Drauglis. 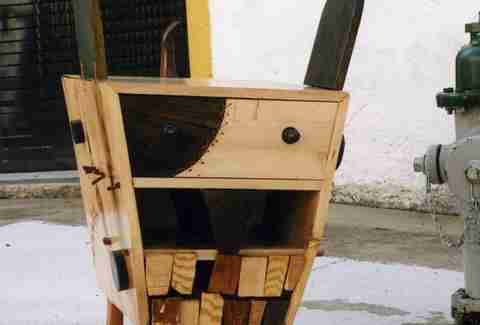 After losing his job when the only theater in Columbus, Ohio closed, AD moved back to DC to begin whittling wickedly creative furniture, splitting time (and wood!) between his in-house workroom and full studio wood shop, and searching online for inspirationally clean pieces of "wood p**n", hopefully avoiding any gross (thumb)nails. 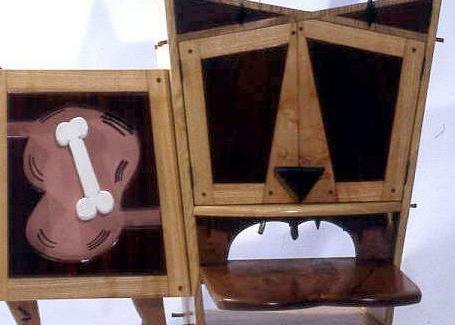 First up's a series of "Monster Cabinets" like "Dog of Monster", a dual-based entertainment center with a tiki-esque dog head (w/ eye cabinets) and a separate body unit complete with x-rayed dogbone; the smaller "Pup of Monster Cabinet" with separate eye and mouth drawers and ears that fold and lock into table leaves; and the original "Monster Cabinet", a toothy face that doubles as a "media center" and "liquor cabinet", or what Pat O'Brien calls "the set". Non-monster sweetness includes the curvy, three-tiered "Six Fifty Four" book shelf made from exotic Paulownia wood, a hulking darkwood piece with a spiky/splintering head and bulbous, draw-laden lower half titled "This is My Body", and a dresser using a naturally bottle-shaped, 5ft slab of Black Walnut as a front facade dubbed "Seven", whose schloads of drawers make it more than Spacey enough. For sittin' pretty/scary, AD's also got some unusual, exaggeratedly-rustic sitters like a Black Cherry armchair, and the woven peach-twig seated "Winonah" -- one star whose presence ensures things'll disappear from set even during the act.